Background: Colonic polyps have proven to be a premalignant stage in the development of colorectal cancer. Data have shown an increased risk of colorectal cancer in the obese population. 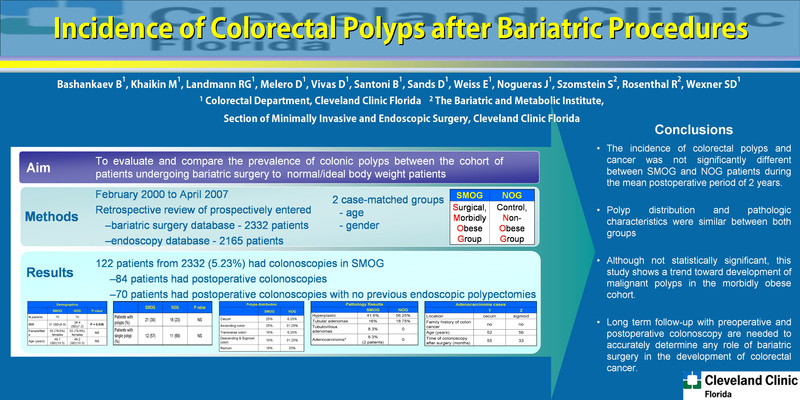 The aim of this study was to evaluate the incidence of colonic polyps in patients who underwent bariatric surgery and compare this incidence to a population who has not undergone bariatric surgery. Methods: After IRB approval, retrospective review of prospectively collected bariatric surgery and endoscopy databases was performed to identify all patients who had bariatric surgery and colonoscopy from February 2000 to April 2007. A group of surgical morbidly obese patients (SMOG) was matched to a group of non-obese patients who had colonoscopy but no surgery (NOG), by age and gender. Body mass index (BMI) preoperatively and at the time of colonoscopy, age, gender, type of procedure, colonoscopic findings, and pathology results were recorded. Results: 70/2332 patients in the SMOG were identified and compared to 70/2165 patients in the NOG. There were no differences between the groups relative to age and gender. There was a statistically significant difference in the BMI at the time of colonoscopy (31vs 28.4 kg/m2, SMOG vs NOG, respectively; p=0.036); 21.4% of patients in the SMOG and 25.7% in the NOG were considered high risk. SMOG colonoscopy was performed after a mean of 23.2 (1-55) months postoperatively. Two-thirds of patients in both groups had no polyps (70% vs 77%, SMOG vs NOG, respectively). Of the polyps detected, the majority were single and equally distributed between the right and left colon; 50% were hyperplastic and 3-4mm in size. There was no cancer identified in the NOG, but adenocarcinoma was found in 2 patients in the SMOG (8.3%; 1 in the cecum, 1 in the sigmoid colon); neither patient was at high risk for colorectal cancer and postoperative colonoscopy was performed at 55 and 33 months, respectively. Conclusion: The incidence of colorectal polyps and cancer was not significantly different between the SMOG and NOG patients during the mean postoperative period of 2 years. However, polyp distribution and pathologic characteristics were similar between the two groups. Although not statistically significant, this study shows a trend to developing malignant polyps in morbidly obese patients. Long term follow up with preoperative and postoperative colonoscopy are needed to accurately determine any role of bariatric surgery in the development of colorectal cancer.